Evangelization is a carrying out of the Divine Mandate of the Trinity to Baptize & Bear Witness in Word and Action to the Love & Truth of the Father, the Son, & the Holy Spirit! From a letter by St. Athanasius: In the Church, one God is preached, one God who is above all things & through all things & in all things. God is above all things as Father, for he is principle and source; he is through all things through the Word (Jesus Christ); and he is in all things in the Holy Spirit… Writing to the Corinthians about spiritual matters, Paul traces all reality back to one God, the Father, saying: Now there are varieties of gifts, but the same Spirit; and there are varieties of service but the same Lord; and there are varieties of working, but it is the same God who inspires them all in everyone. Even the gifts that the Spirit dispenses to individuals are given by the Father through the Word. For all that belongs to the Father belongs also to the Son, and so the graces given by the Son in the Spirit are true gifts of the Father. Similarly, when the Spirit dwells in us, the Word who bestows the Spirit is in us too, and the Father is present in the Word. This is the meaning of the text: My Father and I will come to him and make our home with him.For where the light is, there also is the radiance; and where the radiance is, there too are its power and its resplendent grace. 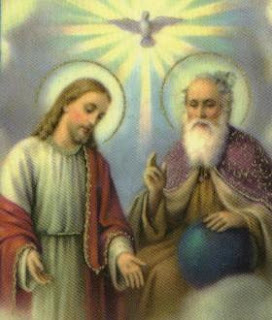 Let us bless the Father and the Son together with the Holy Spirit. Let us praise and exalt them above all for ever. This entry was posted in Catechesis and tagged Dr. Margie Crooks, family, Father, Holy Spirit, Son, Trinity. Bookmark the permalink.